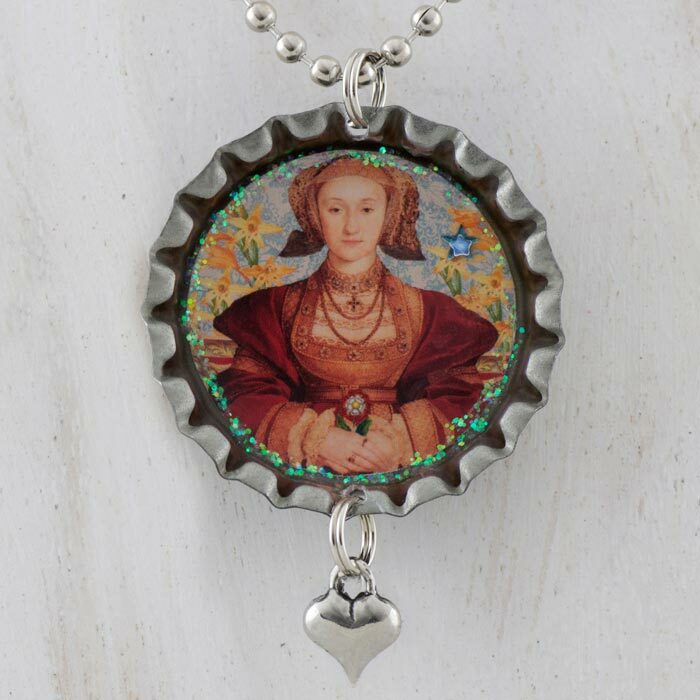 This beautiful, unique and collectible bottle cap Anne of Cleves necklace features an image of Anne of Cleves holding The Tudor Rose with pieces of an antique gladiolus botanical and ornamental papers and bookplates. One of the symbolic meanings of the gladiolus flower is "strength of character". These handmade bottle cap necklaces are a fun way to accessorize with unique images in each one. The inside of the bottle caps are - one of a kind - decorated with gems and glitter. The miniature photograph is protected by a durable, archival resin that safeguards the image from water damage and fading.